On our last day in Kota Kinabalu, a course mate of mine has been generous enough to invite us to dinner; on a very rainy night no less. So off we go to a commercial area called Plaza Juta Likas, very near to the Kg Likas area to one of our host’s favourite spots. He told us that he’d known the owner for a couple of years now and they’d shared an interest in playing football. And since both of us were pretty eager to try out food that is not from the city area, we just went along with him. I was too shy to take pictures of our friend’s meals so my review will unfortunately be limited to mine and my partner’s food. 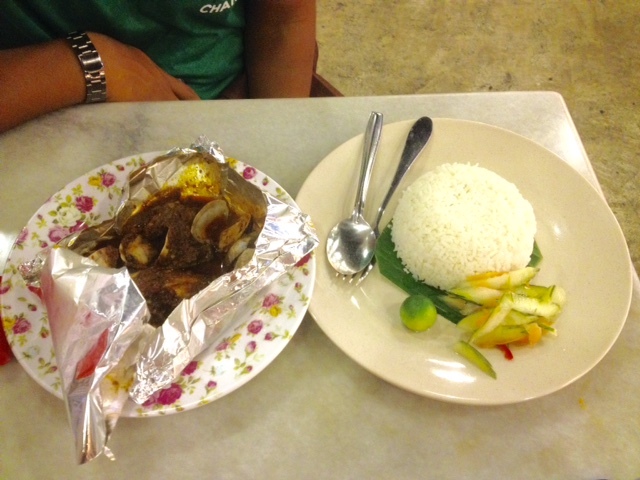 We had their Nasi Goreng Kampung (that was mine – because I was attracted to the people on the next table’s orders. And taste-wise I think that the meal was flavorous and indelible despite the plain look). My partner obviously went for his all time favourite, the Nasi Goreng Special (which according to him was simply delish). There’s also this one particular dish that was highly recommended by our friend (and to which I have stealthily took a picture of while he wasn’t looking – hehehe) called the Telur Pak Din (or something similarly named since that’s what it sounded to me anyway). This dish is essentially an omelette but has been prepared in such a way that it looked (and tasted) like that butter condiments on a typical butter prawn dish. Get what I’m saying? You can just scroll down to see the picture for a better view of said dish. And I must say that I did not hate it either (although it’s a bit too salty for my liking). * Coincidentally, our former favourite burger bakar joint has also open a stall here but they were on a break during our visit. My partner was initially the one interested in stopping by this particular eatery (relatively new to the area since they were not there during our last visit to KK) mainly because of its name. Apart from the obvious, the name actually symbolizes a motor enthusiasts group based in Kota Kinabalu (from what I’ve been told by my partner anyway). As he is a part of a similar group in Tawau, he decided to drag me there one evening (they’re located within the Asia City commercial area, on the same row as De Leeton Hotel and just opposite of the Centre Point shopping mall). It is forgiven for any new patrons to think that the owner of such an establishment is also originated from its namesake Middle Eastern country. But from a short conversation with one of the waitresses, we were told that that was not the case. So it was not really a surprise that the menu is a mix of local cuisines as well as several Indian/Arabic dishes. And what was more surprising was the fact that their food were actually pretty good. We’d ordered their Nasi Goreng Special (it has a fancier name than that but I can’t seem to remember what it was called), Roti Arab and some local kuihs for our lunch. My partner was practically licking his plate clean as the fried rice was just outstanding in taste. Their local kuihs were also exceptional; particularly the curry puff since they’d used actual chicken chunks in their generous filling. But their Roti Arab tasted odd to us though. It might be just a matter of confusion on our part (since the dish was prepared differently in Tawau) but I do not dig the whole powdery texture plus raisins, as the combination tasted weird in my mouth. 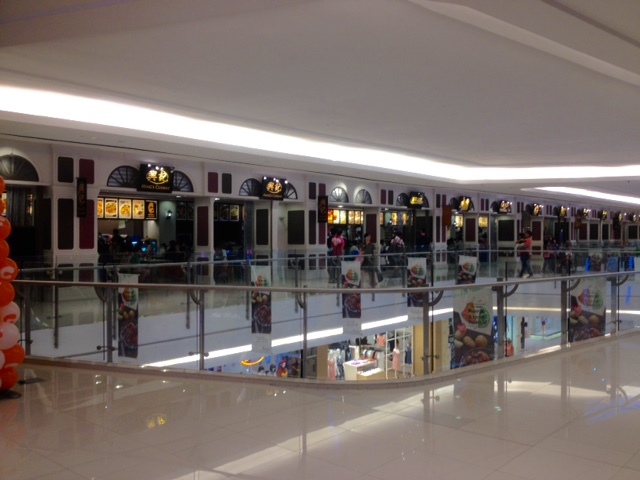 No matter how busy I was during my work related course in KK, me and my partner made sure that we’d stopped by the locally famous Imago Shopping Mall because I was eager to try out their Food Street as it was not available during my last visit. The modern version on a Chinese hawker style dining food court is situated on the top floor of said mall, opposite the MBO cinema. At first glance, the place might be geared more towards Chinese cuisines but rest assured that that is not the case. They were enough variety for everyone to enjoy their food (although by the looks of it, around 80% of the people running the stalls were probably Chinese anyway). We were there during lunch hour so the place was packed with customers but luckily there were a few seats available. It has a free seating concept so no worries on ‘accidentally’ seating where you shouldn’t have. After scanning the choices available, we decided to try out the only 2 stalls that had provided Malay style cooking. My partner decided to order Tenggiri + Lala rice set from this stall called Belacan’s while I’d went for Nasi Mandy Arab from the stall next door named Lesung Mas. Looking at the pictures below, you would’ve expected my partner’s dish to have a dynamite taste but instead what we got was a ‘belacan’ (shrimp paste) based sauce that was surprisingly in dire need of salt. 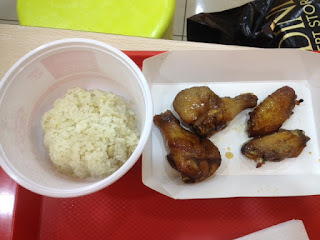 Mine was worse, what with the very undercooked and still in their ‘beras’ state rice and the tasteless and dry chicken. Not a good first impression indeed. Another thing that I would like to comment on is regarding the drinks. I would like to suggest to the management team to provide a drinking station. Right now, almost all of the stalls sold their own drinks independently and were limited to some mineral waters and soft drinks. We initially thought that there’s a drinking station somewhere within the premise so we did not bought any drinks from the stalls that we’d visited. We ended up going back to the same stalls to buy some mineral waters separately. Next on the agenda is another one of these Malaysia’s beloved chicken rice restaurant chain. My partner was all pouty since we kept going to new places (totally my fault of course) to eat so to cheer him up, I suggested that we stop by this place when we’re walking around the lower ground floor area of the Suria Sabah shopping mall. The multiple franchises in Sabah were notorious for having snail paced service but we took a chance after noticing that it’s still pretty early (well, not exactly that early since it’s already almost noon by the time we were standing in front of the eatery) and there were barely any customers yet. And our gamble was eventually paid off since their service was fairly good during that hour. Yup, now there’s a new tip for you guys right? As me and my partner made our way to the ground floor of Centre Point shopping mall on the second day (because I got some time to spare for lunch before my course begins again for the day) we were somewhat greeted by this very colourful fast food joint near to the Body Shop and City Watch store. I honestly don’t know the significance of their vivid looking under-the-sea wallpapers (yes, I know that Sabah is the place for beautiful sea life but this is a fried chicken place for crying out loud) but I must say that I did not let that stop me from trying them out. I initially had absolutely no expectation for their food due to our unfamiliarity to the brand. A quick search online suggested that this is still a fledging brand so we had no idea what to expect. After looking through their menu for some time, we decided to take on their BBQ Chicken Combo set (which consist of 4 pieces of BBQ chickens, rice and a drink) and also the Kinabalu Burger set (a double chicken burger plus a milkshake). 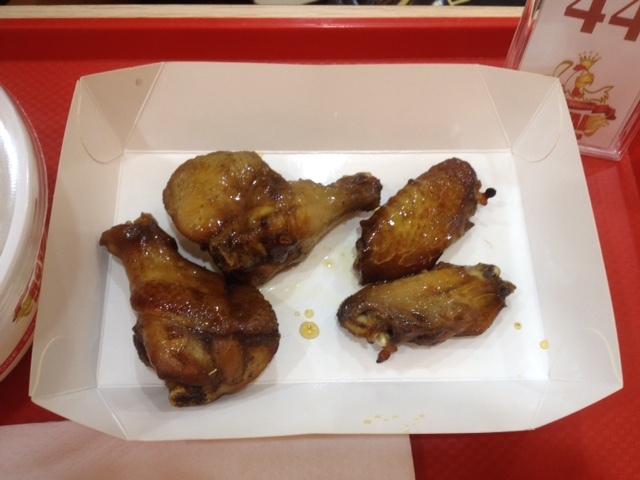 My partner said that he like the sweetly marinated chickens but also noted that the portion could be better for the price that we’re paying. And I’m going to say that I wasn’t disappointed with their burger either. The patties weren’t that notable (but still quite tender) but what really made the food popped was their delicious cheese source and mayonnaise. I’m really not a fan of sauces but this time the sauces really did made the whole burger tasted more scrumptious and (literally) finger-licking. Their chocolate milkshake however was just passable in taste. But I did noticed that there seemed to be quite a number of people stopping by just to sample their soft ice-cream though. Maybe I should try them out on my future visit. As usual, several of my reviews from here on will focus mainly on my recent work related trip to Kota Kinabalu. I have managed to rope my dear partner into accompanying me as he was still in sulking mode on not being able to have our annual holiday last year. It was already late in the evening when we finally managed to check into the hotel (see previous post) and as we’re a bit jet lagged and just stones away from the Centre Point shopping mall, we’d decided to find something to eat within the premise. I was also hell-bent on finding new places to eat (as my partner has the tendency to repeatedly visit places that we’d frequented before) so I quickly manoeuvred him to the lower ground floor area where the main food court is at. I remembered that there’s this Chinese Muslim restaurant that I had initially wanted to try before and I was quite happy to find out that not only does it’s still opened, but has also managed to expand their business into two shops now. We were given this extensively pictured menu upon sitting down and I was amused to find that the menu was mainly in Chinese language (but they do provide the English translations as well). Communication with some of the waiters and cooks (who were originally from China) might be tricky since they do not speak either English or Malay that well. So after going through the pictures for awhile, I finally pointed my finger at their Sweet BBQ Sauce Chicken with Noodles since I have been admiring the Chinese guy’s skill in hand-pulling these delicious looking noodles from scratch (and by that I mean from its original dough form). And I must say that I’m impressed with the noodle’s springy texture, as well as the well portioned and tender chicken chunks. My partner decided to forgo the menu altogether and opted instead for their Nasi Campur option that were available in front of said eatery. Choices were pretty limited by the time we were there but my partner said that he still enjoyed the ‘very Chinese’ tasting dishes. I was surprised when my boss gave me a letter recently, instructing me to attend a course of sorts in Kota Kinabalu for almost a week. As I was dying to get out of the workplace, I welcomed the letter with open arms. The only downside to this was that I needed to find my own accommodation and food, using my own expenses before being reimbursed later on… which is not something that I looked forward to since I was on a tight budget. After combing through the ever handy hotel booking apps for awhile, I’ve decided to try this particular hotel since it is located within the Warisan Square area; an area which I’m very familiar with and with lots of affordable food opinions nearby. 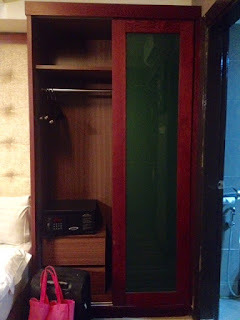 More importantly, the boutique hotel was also within my tiny budget. So despite some negative reviews from TripAdvisor.com, I decided to just cross my fingers and hoped for the best. And you know what? Thankfully I had a pleasant experience with them. Despite the main lobby being at the ground floor area in Warisan Square (it’s on the far left side of the building), the lifts going to the rooms were disconnected from the lobby and is actually located at a very public area within said mall. Since this is not my first time experiencing such a condition, I took it as it was and went straight to block B for my room. It’s good to note that they do have a secure entrance on every floor whereby only patrons with keycards can access the area. I initially did not have any problems with the room that was assigned to me. I mean, it might be small but it’s still very pleasing and comfortable. I have stayed at the hotel several years back when it was still known as Myne Hotel and the décor was exactly as it was before. But at around 1am, the air-conditioner inside my room suddenly decided to act out and completely shut down. After calling for the maintenance guy, he recommended that I switched to a new room as he might took some time repairing it. Changing rooms went on smoothly and I was happy to be put into a room with a better view the second time around. Kudos to the hotel team for their non-fussy response and swift action. Everything else went on swimmingly after that and I did enjoy the rest of my stay. And if you’re driving, then I’m sorry to tell you that they have very limited free parking spaces in front of the premise (maybe around 3 or so only) and you do need to pay a hefty sum to park elsewhere nearby.